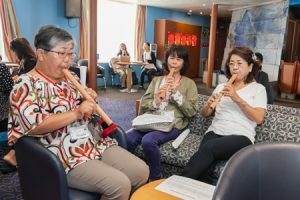 Illay has graced us with various musical performances during their time on board. Today, they held a quena-making workshop. The quena is a traditional South American flute, which Illay frequently uses in their live performances. The workshop included some intricate work like drilling holes; a few milimeters off and the sound changes completely, so participants were all concentrating intensely on the task at hand. Once the quena was complete, the participants had a chance to play their new instrument. 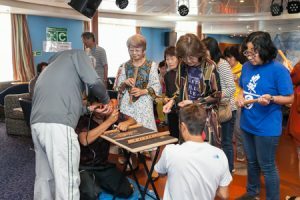 Some workshop participants commented, “I want to practice so that I can play the quena that I made well.” At the end of the workshop, it is clear that there are plenty of quena players to practice with! We are all looking forward to hearing the warm tunes of the quena onboard the Ocean Dream during the voyage ahead.